In August, I made what has become my annual trip to south central Oregon to collect Paeonia brownii seeds. I was a little apprehensive of my chances of ﬁnding many seeds, since last year a drought had caused most plants to go dormant by early August, and most plants had not produced seed. This year would hopefully be different since there had been record snowfall and adequate Spring rains. 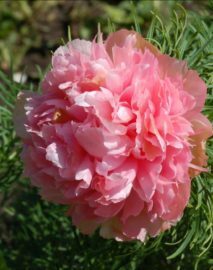 Peony growers, however, say that the year previous is what makes the flowers and hence the seeds for the following year. Anyway, my hopes weren’t too high. As it turned out, there was no need for concern. All of the peonies were still green — not a sign of dormancy. Most plants had produced abundant seed crops. On one of the largest plants, I counted more than 500 seeds. One flower, on the same plant, had 9 follicles (pods) that contained more than 40 seeds. 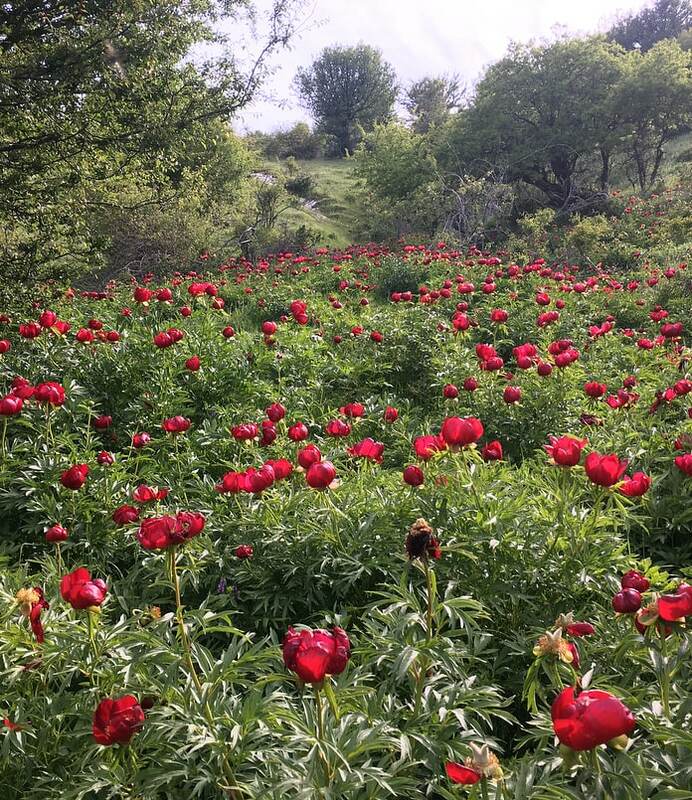 Since the plants were not dormant and showed no signs of dormancy it can probably be assumed that Paeonia brownii does not need a dormant period in late Summer. Like Mediterranean peony species it appears that dormancy is an adaptation to dry Summers and not necessarily a requirement. 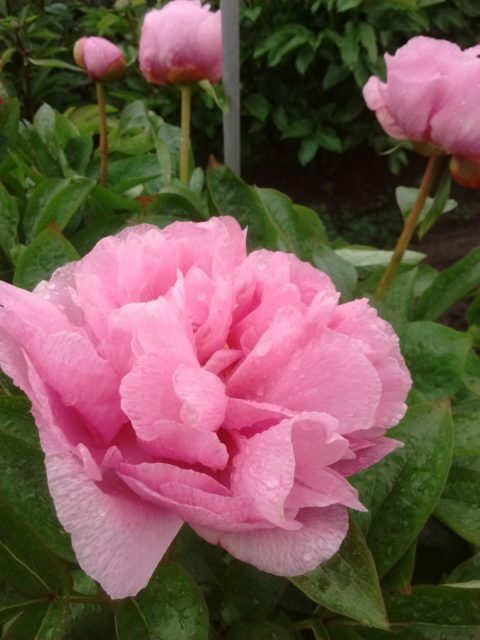 This is good news for those who try to cultivate Paeonia brownii in wetter climates. I tried to collect a few seeds from as many plants as possible, so that I did not take too many from any one plant. I also planted seeds throughout the colony. For some reason this colony has an abundance of very large plants, but few small plants. By planting seeds I hoped to increase the number of small plants. Besides, sticking my finger in the porous, volcanic soil to make a planting hole was great fun — kind of like planting sweet corn when I was a kid. I sent most of the seeds I collected to nurserymen, botanical gardens, and individuals in the U.S. and many foreign countries. 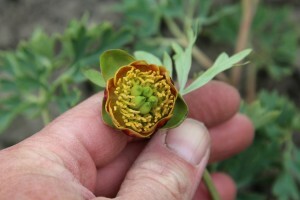 It seems that Paeonia brownii is a very rare plant outside of its range. I also kept seeds for my own attempts at growing Paeonia brownii. Last year was my first attempt at growing this ﬁckle plant. Nearly all of the seeds I planted in the Fall came up in late February, but most soon died after producing their ﬁrst true leaf. The only survivors were those planted in raised beds that had been filled 2 feet deep with 1/3 sand, 1/3 peat, and 1/3 humus-rich top soil. All of the seedlings that died were in clay soils. 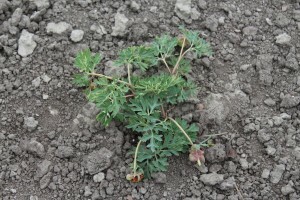 I also planted seeds of Paeonia californica in the same raised beds. These seeds came up about 2 months later than the Paeonia brownii seeds, but grew faster. It turns out that Paeonia brownii needs cold temperatures to germinate (this can be done in the refrigerator) while Paeonia californica does not. Some of the Paeonia californica seeds that I planted in pots this Spring came up in September. Ruud 11 months, 3 weeks ago. I live in the sandy desert-like area of Oregon that Galen mentions, but have only recently begun to pay attention to P. Brownii. When one hears of how difficult it is to grow a plant that is relatively common in one’s home area, it helps a person appreciate just how unique their home conditions may be. In my location, P. Brownii grows in areas of pine, as one moves from the high desert up into the forested eastern foothills of the Cascade mountains at elevations around 4500′. All plants that I have seen are tucked in amongst taller brush, in areas under scattered Ponderosa Pine, so I would say that they thrive in filtered shade rather than full sun. These areas of sandy volcanic soils usually have a persistent snow cover during winter, with very little rainfall in summer. One notable aspect of P. Brownii is just how early it blooms. Last spring I visited a population of plants which are 10 miles further up in the mountains from my house, at a higher elevation and where conditions are colder than at my house. These plants had full foliage development, and were in full flower, while the earliest garden hybrids at my house were still in early development, and perhaps a month away from flowering. P. Brownii is quite short as well – perhaps 12″ tall at best. 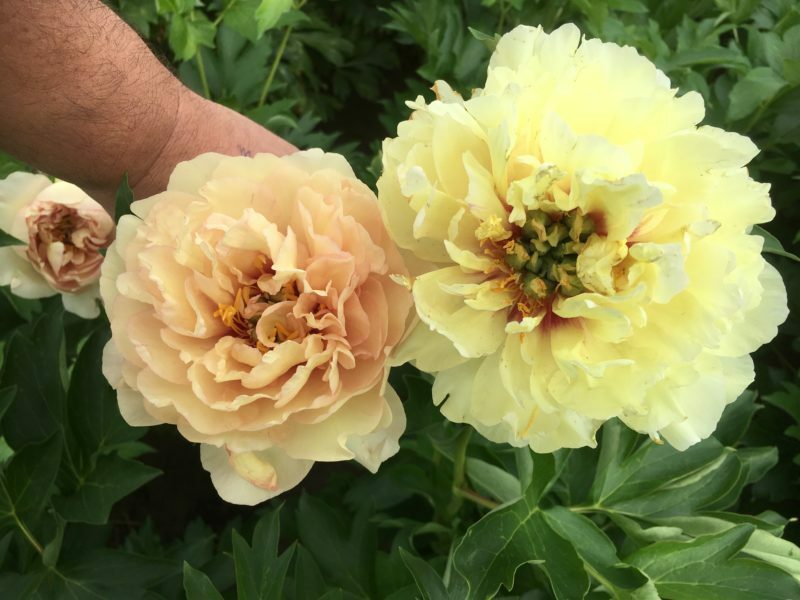 As a result, hybridizing these plants with other members of the peony family would involve using saved pollen from the previous season, or fresh pollen from areas where the season is advanced. One would need to be right on the spot (and perhaps down on one’s stomach !) in the area where the plants are, in the early morning when the flowers are first opening in order to guard against open pollination. I need to be more observant I’m afraid, but my impression was that pollen on these plants is somewhat scarce, so collecting it for use on other sorts of peonies might be difficult. 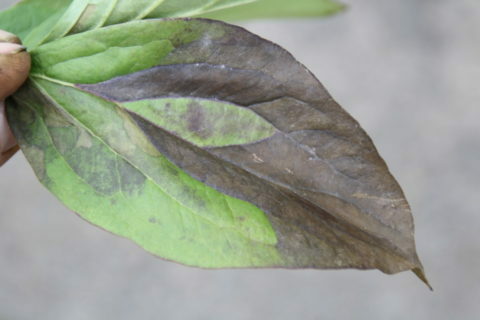 According to Nan Vance, the pollen itself is often not particularly fertile, even when used on other P. Brownii plants. Given that few if any growers seem to have luck in growing P.Brownii in their home gardens, if one were to undertake something like this, my sense is that it would have to happen out in the woods, with native plants in the ground, where keeping track of one’s results might be problematic. 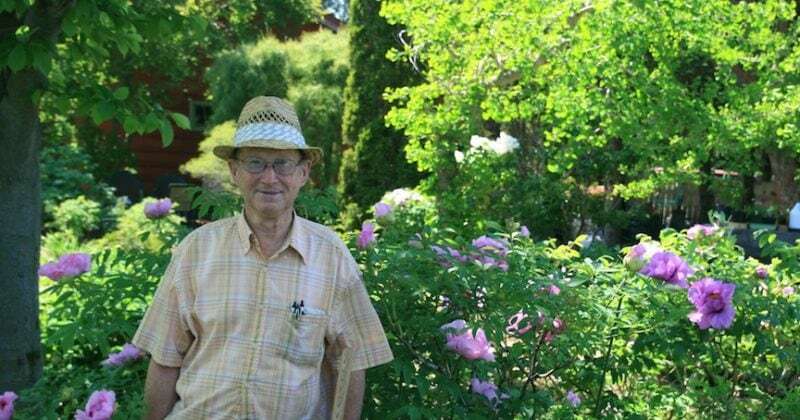 Anne Oveson had these very conditions at her ranch in Wallowa Oregon, and claimed to have gotten some hybrid plants, but her location was remote, and to my knowledge no other peony growers had an opportunity to see them prior to her passing away, and her garden being dug under. 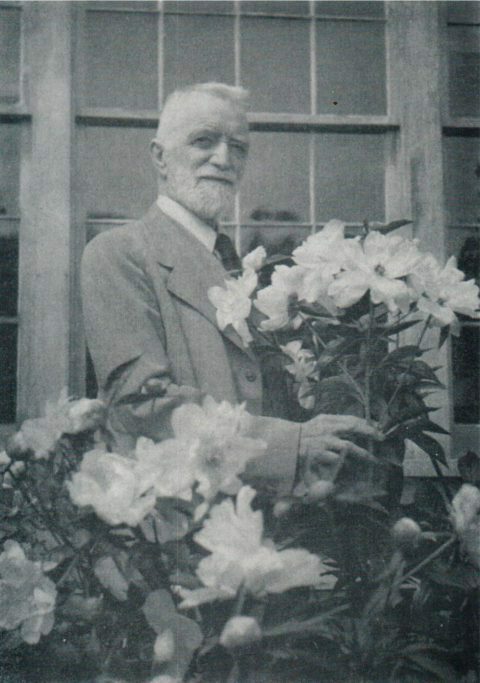 Galen was fortunate to get as many seeds as he did. On a collecting trip during the summer of 2017, I had to visit perhaps 20 plants to recover 100 seeds. The previous summer had been quite droughty, followed by a winter of higher than normal snowpack, so Galen’s comment regarding the effects of the previous summer having an effect on seed production the following spring ( even if the current spring is damp) may be true. These seeds were then sent to the APS seed exchange. Walking casually in the woods, would one be able to identify this plant as a member of the peony family ? Once one knows what it is, the plant is easy to identify, but otherwise probably not. However the pods and seeds in late summer are quite peony-like. As an aside, my seed-collecting trip was actually a impromptu side-stop on my way to a dinner at Black Butte Ranch in the Cascade foothills. When I arrived at my friend’s, she had a guest who has a home on the very southern tip of Baja California. I was proudly displaying my seed haul, which included many seeds in their pods, and this woman knew just what they were, as a result of having many plants of P.Californica ( “range poorly understood” according to one source) growing around her place in Southern Baja. Interesting stuff, Bob! I’m one of the stubborn ones giving it brownii a go this year. I received a specimen from Wolfgang Gießler last October, grafted on delavayi-root. That root sure looked great when I planted it. I have good hopes it will flower this spring already, as is usual for these types of plants. From what I understand from Wolfgang, brownii is fine with wet winter conditions, but it cannot handle water on the crown in the summer (that critical time would be starting after flowering, I presume). Well, that will be tough luck for it in our Dutch climate….. I am hoping for multiple flowers, and will try to get some pollen from it and keep it for an odd-ball pollination. Probably the best I can do, since I don’t expect it to live long – brownii just doesn’t seem designed for our Dutch “summers”. Although I remain hopeful that the furious power of delavayi will keep it alive for more than one growing season. I’ll try to give an update here in April when it decides to show top growth for me. It would be interesting to see a mature root system. But I’m glad you’re respecting the wild enough not to be that bold. Here it is again Bob, in the Dutch Dirt. Needs “The Hand”, but fun it is. Now to see if I can get some pollen from it.